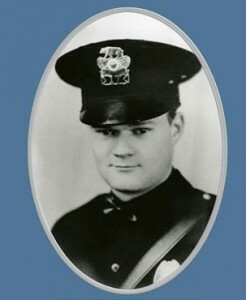 On Saturday, January 3, 1942, Officer Edwin A. “Ed” Blakely was working traffic enforcement with Officer T.C. Stuteville, both on motorcycles. A seven-year veteran of the department, Officer Moore had been working as a traffic officer for two years. Just before 7 o’clock at night, Officers Blakely and Stuteville were northbound on Riverside Avenue approaching West Highland Avenue. They saw a vehicle drive out in front of them and accelerate towards Highland Avenue at a high rate of speed. Later, at a hearing at the Coroner’s Office, Officer Stuteville testified that Officer Blakely had told him, “Let’s take out after him; maybe he’s up to something.” The officers began to pursue the speeding car, and as they made the turn onto Highland Avenue, Officer Blakely’s motorcycle began to slide. He lost control of the bike and ran off the side of the road into an orange grove, where he struck a power pole, breaking his neck. Officer Stuteville rushed to his side, made sure he was still breathing and then ran to a nearby farmhouse to call for more help and an ambulance. According to reports from one local paper, the doctors at St. Bernardine Hospital said that because of his injuries Officer Blakely could not have lived for more than a few minutes following the crash. The reckless car they had been chasing sped off and was never found. Officer Blakely was rushed to St. Bernardine Hospital but died of his injuries before arriving at about 7:20 p.m. He was the second San Bernardino police officer in the history of the department to die in the line of duty. Ed Blakely was 28 years old at the time of his death. He was a native of San Bernardino and had graduated from San Bernardino High School. He was the son of Mr. and Mrs. Thomas E. Blakely of San Bernardino and was survived by his wife, Grace; a stepson; and a brother, Thomas Blakely Jr. In May 1997, Mrs. Bea Schubert, Officer Blakely’s first cousin, wrote to the San Bernardino Police Department. She said she was a newlywed living in San Diego at the time of Officer Blakely’s death. She talked about the family’s Irish heritage and said he was known to family members as “Pat.” She recalled that he was “full of tricks, always clowning around and always pulling jokes on everyone.” She recalled how he loved his job with the San Bernardino Police Department and that he took his work very seriously. Mrs. Schubert’s brother, John H. Bromilow, also served as an officer for the San Bernardino Police Department.